Seven Fish is the restaurant youâ€™d love to call your own. Joining two old town streets, it is Key Westâ€™s hometown bistro, its own corner eatery. This one is different from most in that the comfort food includes fresh, local fish. Call it a fish-style bistro, where mahi-mahi and sashimi mingle with meatloaf and steak. Seven Fish is walking distance from Duval Street, but doesnâ€™t feel like a tourist town eatery. It is a smoke-free, tastefully accessorized space. 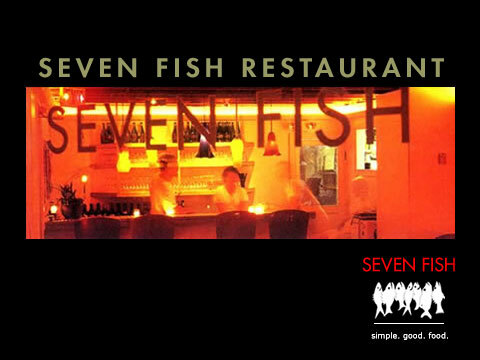 Donâ€™t miss a night at Seven Fish next time you visit Key West. Our offbeat location, cozy environment and satisfying food will make you think youâ€™ve found yourself a new hometown. Reservations are recommended. The New York Times, 2000. "Housed in a blink-and-you'll-miss-it former luncheonette, Seven Fish has a chic interior with a number of small square tables and metal-topped bar. The food was deliciousâ€”we started with a seriously good roasted red pepper and goat cheese salad, and then moved on to the fresh fish that is the restaurant's claim to fame. Stuart had grilled mahi-mahi with dried peppercorn sauce over roasted red potatos, and I had yellowtail snapper sautÃ©ed in a Thai-curry cream sauce."